It would appear that travel not only broadens the mind but seemingly expands the vocabulary. It's not a development that I particularly relish as I am surrounded in a ceaseless chant of blasphemy. Fortunately, they stick to the letter abbreviations rather than the words themselves, but it sends an entirely wrong message to the natives. To be fair, if not even handed, the children are united in the opinion that they are really saying 'oh my gosh,' but few people give us the benefit of the doubt. Maybe it's the American accents but heads turn and I'm sure to blush. They acquire curious variations on old themes such as 'little guys first in case they burst!' and 'apology not accepted,' although neither phrase endears them to their relatives. The final straw comes in an unexpected format. I am uncertain who was more surprised? Predictably, we have absorbed each of the six phrases that the Dalek's micro chip provided. We hear them frequently. 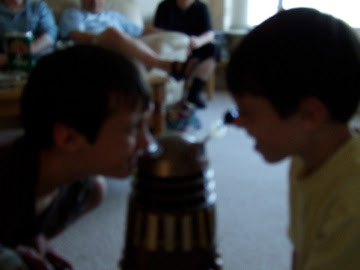 Luckily, in England, if a child wanders the streets saying “exterminate, exterminate, exterminate,” no-one turns a hair. I suspect a different reaction in America. There again, if it wipes out the ‘England is Evil’ mantra all l shall be well. On the other hand ‘England is Evil’ in America might have all sorts of unforeseen repercussions. Thank goodness for duct tape! Posted on July 9th, 2008.